This was a Christmas present for my 5-year-old niece. 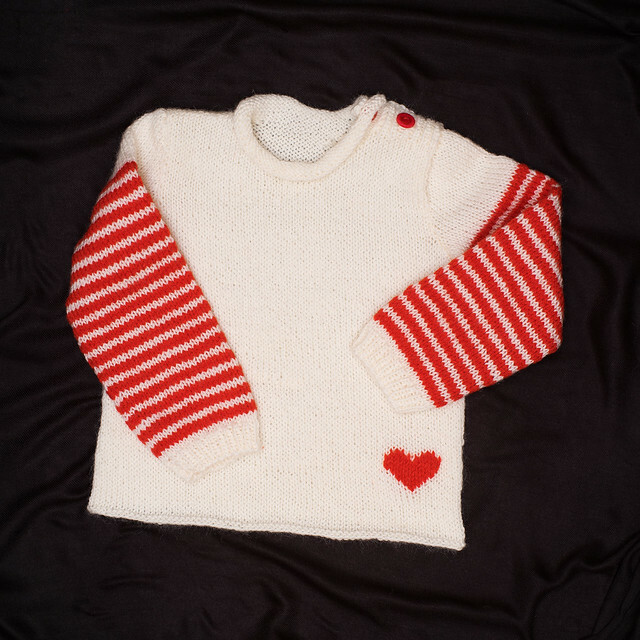 Oh, how quick it is to knit a 5-year-old-sized jumper! I used an Angry Bird jumper pattern but because I used yarn from my stash, I didn’t have enough red to knit an Angry Bird jumper. I just took the measurements and the numbers of stitches from the pattern. The yarn is probably as old as me, named Novita Cora. It was my grandmother’s, then it ended up as my mother’s, and now to me, and I knitted it for my sister’s daughter. Ha, how to involve generations with just one jumper! The little heart was done by duplicating stitches. I found two round red buttons in my stash with a heart image in the middle, which were perfect. The jumper is a good fit. I hope they remember to wear this jumper now that the temperatures are close to -20C even in the south, where they live. That is so cute! Do you find the yarn degrades over time at all? Or do you have it stored carefully in some way that preserves it? I don’t really know. I assume the yarn is just fine. It looks like yarn, it feels like yarn. I have no idea how it’s been stored for the past 40 or so years. My guess is that it’s been in various plastic bags all this time. I don’t really know anything about the ideal yarn storage. Maybe I should look into it. I guess if it doesn’t get eaten by moths, it’s ok. Probably, I was just curious. Looks great. I’m sure she will be lovely and warm in this.